Many small business owners have the passion and expertise necessary to run their businesses, but keeping journals and tallying accounts can be mystifying. In Accounting Is Not a Foreign Language, I guide readers through the fundamentals and complexities of accounting, using clear and straightforward terms to explain what all those numbers actually mean. My book will will assist anyone in keeping accurate, updated accounts and establishing a basic understanding of accounting. From debits and credits to income statements, I demonstrate just how to make accounting work for you, laying a foundation for future growth and profit. As this book transforms the complex nature of accounting into a clear, easy to understand way, it takes a step by step approach, starting from the very basics of accounting and building up to the more difficult to understand facets of accounting. After each chapter is a chapter summary which summarizes what you just learned, helping it sink in. The most amazing part of this book is my approach called the LINKS, giving a new way to grasp the concepts. Written for college students, small business owners, human resources or personnel, or anyone who just fears accounting and would like to realize that it is possible to understand accounting. Read this and you will be pleasantly surprised. Published by Brown Books. "Finally a book for all us non-accountants who have careers in the accounting profession. Simply put, this books makes the complex understandable. It's a fact that administrative professionals working in the public accounting profession often struggle to understand the technical aspects of what accountants do for their clients. 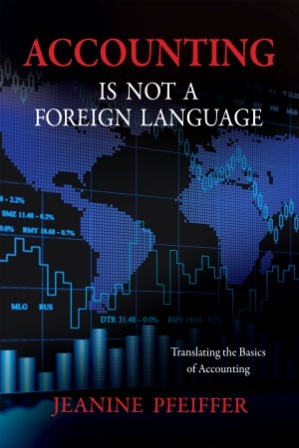 I recommend "Accounting is Not a Foreign Language" to all of the marketing, human resources, technology and other administrative professionals working in the public accounting world." Named in Accounting Today's list of the "Top 100 Most Influential People"
"Great idea for a book, it explains so much about the confusing world of accounting"
"Full disclosure. I won this book through a First Reads giveaway on Goodreads. Such a great book. Great information. I would Def recommend to a friend."